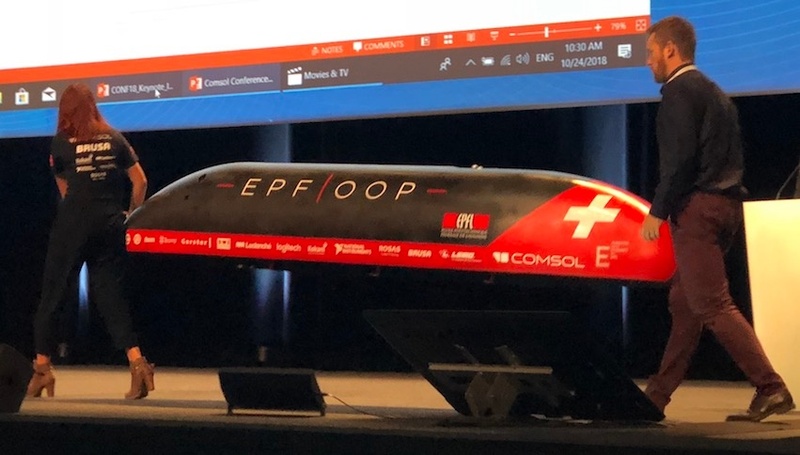 The EPFLoop team took the stage at the COMSOL Conference 2018 Lausanne with their hyperloop pod design, setting it down for the crowd to see. Learn about the different ways that the team of students and faculty from the École Polytechnique Fédérale de Lausanne, led by Mario Paolone and including Nicòlo Riva, Zsófia Sajó, and Dr. Lorenzo Benedetti, used multiphysics simulation to land in the top spot for hyperloop design at the 2018 SpaceX competition. The basic idea behind the hyperloop is a pod used for high-speed, intercontinental transportation that is self-propelled for long distances while avoiding losses. The idea sounds futuristic, but it has actually been around in some capacity since the 19th century. The hyperloop concept has been popularized in more recent times by Elon Musk with the SpaceX competition. SpaceX has a testing tube in Los Angeles, California, that is open to student teams from around the world so that they can compete their hyperloop pod designs in vacuum conditions. Members of the EPFLoop team carry their pod design onstage. EPFLoop is the hyperloop team for the École Polytechnique Fédérale de Lausanne (EPFL). 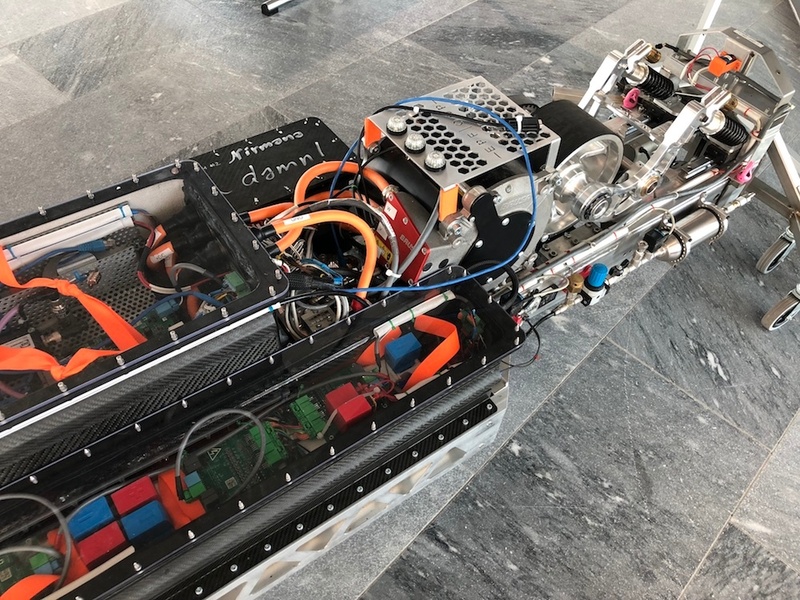 The team used the COMSOL Multiphysics® software to design their hyperloop for SpaceX 2018, where it placed first in design, first in Switzerland, and as one of the top three teams in the world. Different members of the EPFLoop team discussed different aspects of the pod’s design and how multiphysics simulation played a role. To design the aeroshell (outer layer) of the hyperloop pod, the team relied on aerodynamics, CFD, and structural analysis. They used the High Mach Number Flow interface in COMSOL Multiphysics®, as well as the add-on Optimization Module and LiveLink™ for MATLAB® interfacing product. The simulation analyses assured the team that their hyperloop design was ready to be tested; produced; validated; and finally, shipped to California for the competition. The pressure vessel component is important to the hyperloop design, because direct exposure of the pod’s components to the vacuum of the SpaceX test tube could cause the system to destruct. The EPFLoop team analyzed the pressure vessel’s structure and temperature profile using the Heat Transfer in Solids and Shells interfaces in the COMSOL® software to predict the pod’s behavior and optimize their design for these special conditions. An inside peek at the hyperloop pod design. A hyperloop’s braking system is what enables it to accelerate and decelerate safely (and as you’ll recall, safety is one of the five KPIs of the hyperloop concept). The EPFLoop team sought to analyze the temperature profile of the braking system using the Heat Transfer in Solids and Translational Motion interfaces in COMSOL Multiphysics. 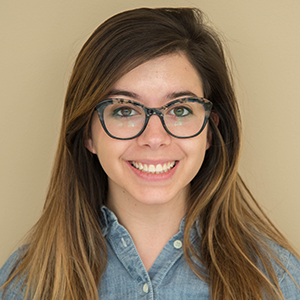 Designing a hyperloop not only provides a useful product for educating students but also a way to “innovate in the field of transportation,” says Benedetti. The team is already starting to work on their design for SpaceX 2019. Get more details on the EPFLoop project by watching the full keynote presentation at the top of this post.